South Korean President Moon Jae-in (left) and North Korean leader Kim Jong Un shake hands after signing a joint declaration at the Paekhwawon State Guesthouse in Pyongyang, North Korea, on Wednesday. In their third summit, Kim and Moon also laid out plans to draw down forces along their heavily fortified border and announced an agreement for their athletes to compete as a single team at the 2020 Olympics in Tokyo and to submit a joint bid to host the games in 2032. In addition, the two leaders agreed that before the end of the year, they would participate in groundbreaking ceremonies to link railways along the east and west coasts of the Korean peninsula. Moon said that the two sides agreed that the Koreas should become a "land of peace without nuclear weapons and nuclear threats." Kim called the agreement "a leap forward" toward peace between the two historically bitter rivals. In it, defense chiefs from Pyongyang and Seoul said they would establish "buffer zones" between their land and maritime borders to reduce the possibility of accidental military clashes. 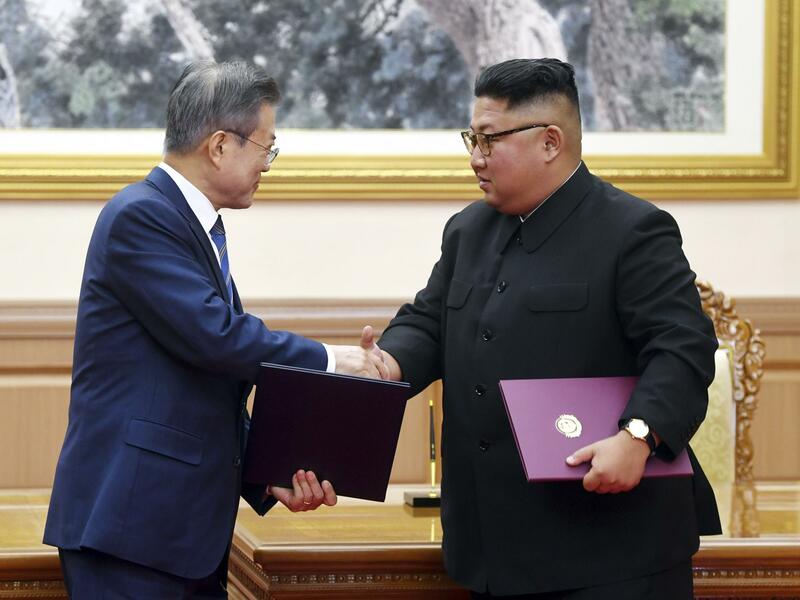 They also agreed to withdraw 11 guard posts from the Demilitarized Zone along the 38th parallel that acts as the de facto border between the two sides, who remain technically at war more than six decades after the Korean conflict ended without a peace treaty. North Korea would also shut down its Dongchang-ri missile engine testing and launch facility and allow the process to be monitored by international observers. The North promised to dismantle its Yongbyon nuclear weapons facility as far back as 2007 and the significance of shuttering the two facilities is not clear. The North has demonstrated a capability for using mobile launchers to fire its ballistic missiles and some observers believe Pyongyang maintains secret nuclear facilities in addition to Yongbyon. Although it was not clear what "corresponding" U.S. steps North Korea expected as a condition to make good on the promise to shut down Yongbyon, President Trump, in a tweet just after midnight, appeared to deem the summit a success, calling it "Very exciting!" Even so, lasting rapprochement between the two Koreas has proved elusive in the past, with hopes for peace degenerating into renewed recriminations and saber rattling following two previous summits in 2000 and 2007. Although Trump has remained optimistic about improved relations between Washington and Pyongyang, the initial euphoria following the Singapore summit in June — after which the president declared that North Korea was "no longer a nuclear threat" — quickly wore off. Follow-up meetings between Secretary of State Mike Pompeo and North Korean officials failed to produce concrete results, and Pyongyang quickly returned to its bombastic anti-American rhetoric. As The Associated Press notes of the agreement, "... while containing several tantalizing offers, it appears to fall short of the major steps many in Washington had been looking for — such as a commitment by Pyongyang to provide a list of the North's nuclear facilities, a solid step-by-step timeline or an agreement to allow international inspectors in to assess progress or discover violations." Moon on Wednesday acknowledged, "there will be challenges and trials, but the more we overcome them the stronger we will become." "We are not afraid of future challenges," he said. Harry Kazianis, director of defense studies at the Center for the National Interest in Washington, tells NPR that keeping the lines of communication open between North and South is paramount. "If we are going to have change in the Korean Peninsula, if we're not going to have a war, you need to have some sort of political framework where all sides will keep talking," Kazianis says. In a reference to some of Trump's harshest threats against the North before tensions finally eased, Kazianis says as long as dialogue continues, "if there are rough patches, if there are problems, we can talk our way through and not go back to fire and fury." North Korea's leader Kim Jong Un says he will visit Seoul, South Korea, before the end of this year. That's a big deal for a regime whose leaders have never been known for traveling much, and is an even bigger deal that Kim Jong Un would visit the capital of a country with which North Korea is still officially at war. NPR's Rob Schmitz has been covering this summit between North Korea's leader and South Korea's leader. Hi there, Rob. ROB SCHMITZ, BYLINE: Hey, Steve. INSKEEP: What's the symbolism and the substance of this announcement that Kim Jong Un is going to come across the DMZ? SCHMITZ: ...Which is in Pyongyang. INSKEEP: OK, so you're on the same peninsula. OK.
SCHMITZ: (Laughter) Yeah, as the crow flies, it's not too far. SCHMITZ: But when he announced that, there was this very loud collective gasp from the crowd. You know, people were not expecting this here, and they were really surprised because it is a very big deal for Koreans. It would be the first time a leader of North Korea has ever visited the capital of South Korea. And this is a pretty bold move by Kim Jong Un. He's visiting a city where many people still hate him and his regime. And they also have the right to protest his visit, which I'm sure they will when he comes. INSKEEP: Although he's been clear about what he wants. He wants an end to this formal state of war between the Koreas, doesn't he? SCHMITZ: Yeah, he does. And it's also pretty clear that Moon Jae-in also wants that. But what's not so clear is how they get to that spot because it's pretty tricky. You have to deal with the U.S., who has to be in on that, as well as China. And those are two states that are not getting along recently (laughter) as we've seen in the news. INSKEEP: And, of course, there's the issue of North Korea's nuclear program. And there was an announcement. The North Koreans say they're going to shut down a missile launchpad. How big a deal is that? SCHMITZ: Well, this launchpad's called Dongchang-ri. It's the most advanced missile test site in North Korea. They launched an intercontinental ballistic missile that has a potential reach the U.S. from this site. So it's important. But what's more important here is that Kim also promised to allow international inspectors to come in and verify that this will be dismantled. I spoke to Harry Kazianis, a director of defense studies at the Center for the National Interest, about this, and he calls this a pretty big step. HARRY KAZIANIS: I think that's a great first step. I think it's important to have international inspectors in there to really track the progress of what North Korea is doing. So I think any inspectors is good, but now we're going to have to see how far Kim Jong Un is going to allow them to go. INSKEEP: Oh, well, that's the big question. What are they allowed to look at? Does history tell you anything? INSKEEP: (Laughter) It does, Steve. You know, that's the big question that everyone in South Korea is sort of pondering. You know, this would not be the first time a North Korean leader allowed weapons inspectors into the country, and many people here remember what happened the last time they came North Korea, under the watch of Kim Jong Un's father, Kim Jong Il. It did not end well. And North Korea eventually developed nuclear weapons. So that's what's different now. The North has these weapons. There's a new North Korean leader. And we've got a U.S. president whose popularity is waning and who is really eager to accomplish something big here. So the ultimate question here is, will Kim give up a nuclear weapons program that he and his father spent so much time and effort building? Most people here are very skeptical, but they do think the only option for South Korea, and for Trump, is to try. I spoke with Yonsei University professor Matthias Maass about this, and here's what he said. MATTHIAS MAASS: As long as there is some talking, some minimal engagement, and so it's much better than violent rhetoric from the North and insisting on sanctions and containment on the Southern side. INSKEEP: OK, minimal engagement. Were there concrete steps forward from this minimal engagement, the latest round of it? SCHMITZ: A bunch of them between the two Koreas. I think the biggest one was that they both said they'd file a joint bid to host the Summer Olympic Games in 2032, which would be quite something. INSKEEP: Rob, thanks very much. Always a pleasure talking with you. INSKEEP: NPR's Rob Schmitz is in Seoul, South Korea. Transcript provided by NPR, Copyright NPR.